I often fixate on a song or album and will listen to it over and over for days (or even weeks) on end. I'm not a particularly devout Catholic, but I almost always have a rosary with me. I've also never taken communion anywhere but a Catholic church--it feels too awkward. I once took an over night trip from Harrisonburg, VA to Ithaca, NY. We were probably gone for about 36 hours and spent more than half of that time in the car. It was totally worth it. I'm really, really sad that I can't do yoga teacher training this fall because of marching band. As much as stupid new stories annoy me (like the local Fox news affiliate running a story on the "Songify" iPhone application), they also bring me comfort. Slow news days mean there aren't any major catastrophes going on in the world. I learned how to do handstand push-ups this week. My heels still graze the wall, but I feel like a total badass when I'm doing them. I have four pairs of the exact same shoes (4" round toe pumps) in different colors/styles. I had owned 3 pairs of these shoes in the past before I ordered them in multiple colors. I can swim well enough to not drown, but I never took any swimming lessons as a child. When I'm at the pool or the beach, I don't feel comfortable in water deeper than my chest. I always giggle (although usually internally) when someone farts during a yoga class. I've been inhaling insalata caprese this week. Sometimes twice a day. It's like food from the angels. 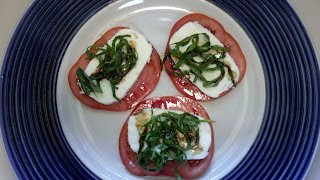 Farmer's market heirloom tomatoes, a sprinkle of salt, fresh mozzarella, farmer's market basil, and balsamic vinegar. Amazing! Nice- I love the tone in this post! Congrats!